I feel like this is a very love or hate foundation. I personally love it! 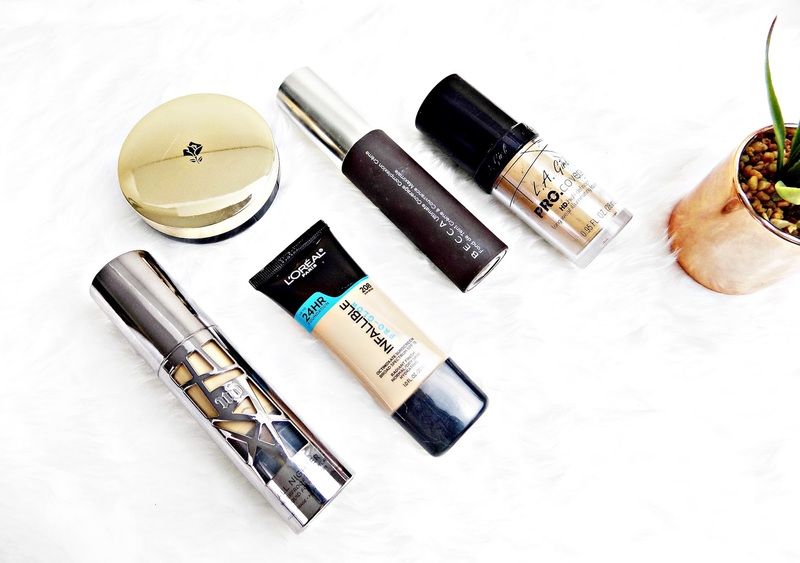 This is probably one of the fullest coverage foundations I own! It pretty much covers everything, without any need for concealer. The consistency of this is thick, but not in a bad way, it's still pretty easy to blend out. I found this works better with a damp sponge, I get a more flawless finish this way. It has a naturally matte finish without being drying at all! The wear time of this is brilliant! It really stays put all day! And with powder this doesn't budge. If you're looking for a long wearing, full coverage base, this is a great option. It pains me that this isn't available in the UK. I got mine from Ebay here. This is a great affordable foundation. It is dewy as the name would suggest but I don't find this compromises the wear time or the coverage, which is impressive as most dewy foundations tend to be sheer but this has a good medium to full coverage. It stays put on me on all day and doesn't wear or go patchy. Because this is so dewy I have to set this or it does go super shiny on me. But with setting powder I have a long wearing dewy base! This foundation is so under rated I hardly hear anyone talk about which is a shame because this is so good! It reminds me a lot of the Urban Decay All nighter foundation in terms of coverage (full) and consistancy but this one has more of satin finish that has slightly more glow to it. Like the others here this stays put all day and I can even get away with not powdering this. The hype around cushion foundations has seemed to died down a bit but my love for this foundation is still strong! It's actually one of the only cushion foundations I've tried so far that has such a good coverage, it's medium but build-able. The finish is more on the matte side but it's not flat or cakey looking. It's not drying at all and lasts all day! I've saved the best until last. I've actually gone through 2 bottles of this and I can't actually remember the last time I used up a whole foundation! This has everything I want in a foundation; it's dewy, has medium to full coverage and is long lasting. The formula is quite watery and super easy to blend, There's nothing I don't love about this foundation and the price makes this an absolute winner. If you have dry / dehydrated skin I really can't recommend this foundation enough! So there's my long wearing base picks for dry / dehydrated skin. Make sure you leave your recommedations in the comments. I'm always in the market for a new foundation! Ben Nye Banana Powder - Worth The Hype? Beauty Pie - What's the Deal?